Enjoy traditional Polish favorites such as pierogi, schabowy, golonka, paczki and more at the only restaurant in the Houston area serving authentic Polish Cuisine. 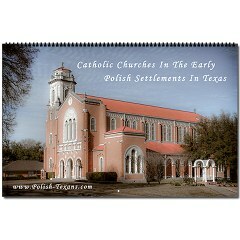 Beautiful 17" x 22" wall calendar with a different photo of an early Texas Polish Catholic church.for each month. 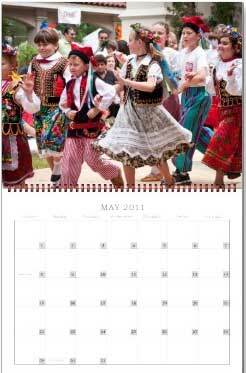 Beautiful 14" x 22" wall calendar with a different photo of one of last years Polish events.for each month. Sweepstakes entries valid from November 21, 2010 until January 15, 2011. 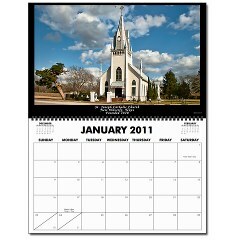 Three (3) prize winners will be selected in a random drawing on January 16, 2011 from among all eligible entries received. As a starter: barsz z uszkami (sort of pierogi with mushrooms). A must for Christmas Eve ‘Wigilia’. 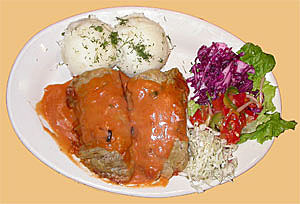 Main: schabowy z ziemniakami i kapusta gotowana(pork chops, mash potatoes and cabbage). then comes Kielbassa, Golabki, Krokiety, Pierogi, Rosol, & Czarnina. And lets not forget to wash it down with Piwo! 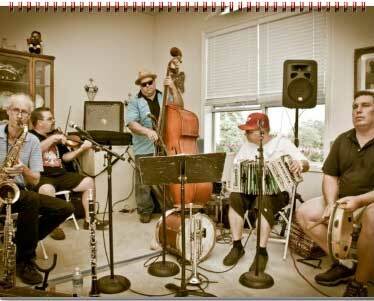 deciding whether to have pierogi or cabbage rolls…….ah both of course!!! There is one thing I miss since I left Cleveland, Ohio and my dad passed away is Rice Sausage…..anyone heard of this? Dear Stanja, Rice Sausage;do you have KASZANKA in mind? Paczki. My grandmother made them everytime we came to visit. She would pinch off homemade dough, fry it and then roll it in sugar. Yummy. I eat a dozen of them every year at St. Mary’s Polish Festival in Brenham. Everything else is second. placki ziemniaczane and sos grzybowy or sour cream …. My favorite entree is Golabki and the most wonderful dessert is Nalesniki, yum yum! potato pancakes, Golonka, Golabki, and kielbasa. Reminders of what my ancestors ate. Pierogi, gołąbki, golonka, rosół, Czarnina, domowy chleb, kiełbasa polska, kiszka, polskiego pączka, ziemniaki naleśniki i wiele więcej! Patato paczki and Kielbasa are the best. I go for the potato pancakes. Polish fudge…These are “krowki,” candies that come in a yellow and white wrapper with a cow on it. Krowki are very different from regular fudge; more buttery and creamy. My favorite food was something Momma called “kapusta.” I don’t know if I spelled that right, or if that is even the right name for it. It was shredded, boiled cabbage, blended into boiled, mashed potatoes, to which she added milk, butter, and vinegar. It was so good! Unfortunately, I can’t cook like my Momma.